The Ryobi 18-Volt ONE+ 3Ah Battery and Charger Starter Kit includes Ryobi new LITHIUM+HP batteries. These batteries feature superior electronics and performance to allow you to work stronger and longer with all 18-Volt ONE+ tools. These batteries deliver superior runtime, power, and performance when paired with Ryobi Brushless tools. They have a durably constructed frame for impact protection and have an on-board fuel gauge so you can easily check your charge at any time. The charger features patented IntelliPort Technology, which protects battery cells, maximizes battery life. It is designed to store the batteries on the charger to condition them for peak performance. 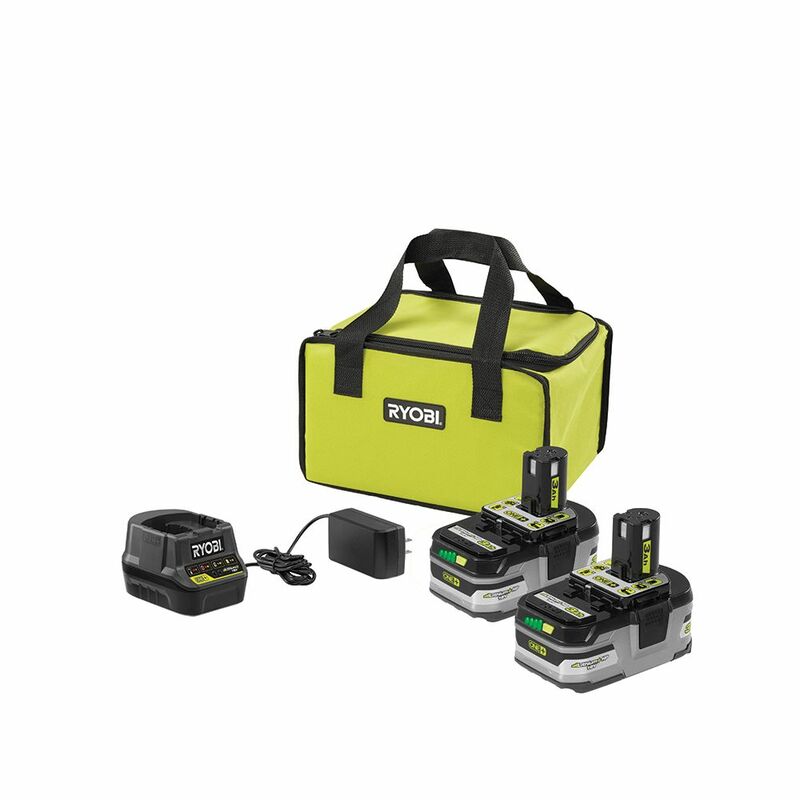 RYOBI introduces the 18V ONE+ Lithium-Ion LITHIUM+ HP 9.0 Ah High Capacity Battery Starter Kit with 18V IntelliPort Rapid Charger. This battery features advanced electronics to allow you to maximize tool performance with added capacity to all 18V ONE+ tools. With superior runtime, power, and performance, this battery can take on more demanding applications than ever before with the introduction of HP technology. HP technology communicates with brushless tools to maximize performance in all applications, allowing users to make faster cuts, drive larger screws, utilize bigger drill bits, etc. It has a durably constructed frame for impact protection and has a built-in 4-bar illuminated charge indicator. The battery can be paired with over 125 tools from RYOBI s 18V ONE+ lineup. This battery is backed by the RYOBI 3-Year Manufacturer's Warranty and includes an 18V IntelliPort Rapid Charger and an operator's manual. This 18V ONE+ Power Inflator is perfect for tires and small inflatables ranging from 0-150 PSI, and its cordless convenience allows you to use in the tool in virtually any location. This Power Inflator is sold as a bare tool, allowing you to build on your ONE+ collection without spending additional money on batteries and chargers, but best of all, like every Ryobi 18V ONE+ blue or green tool, this Power Inflator works with any 18V ONE+ battery. Upgrade to lithium-ion or LITHIUM+ batteries for lighter weight and better performance. 18V ONE+ Lithium-Ion LITHIUM+ Battery Starter Kit with (2) 3.0 Ah Batteries, Rapid Charger, and Bag The Ryobi 18-Volt ONE+ 3Ah Battery and Charger Starter Kit includes Ryobi new LITHIUM+HP batteries. These batteries feature superior electronics and performance to allow you to work stronger and longer with all 18-Volt ONE+ tools. These batteries deliver superior runtime, power, and performance when paired with Ryobi Brushless tools. They have a durably constructed frame for impact protection and have an on-board fuel gauge so you can easily check your charge at any time. The charger features patented IntelliPort Technology, which protects battery cells, maximizes battery life. It is designed to store the batteries on the charger to condition them for peak performance. 18V ONE+ Lithium-Ion LITHIUM+ Battery Starter Kit with (2) 3.0 Ah Batteries, Rapid Charger, and Bag is rated 4.8 out of 5 by 620. Rated 5 out of 5 by MUG1 from Bought this to use for a cordless glue gun. So far, so good. Lasts about 3 hours before I have ... Bought this to use for a cordless glue gun. So far, so good. Lasts about 3 hours before I have to change the battery. Rated 5 out of 5 by Al from Ryobi claims the batteries are good for 1200 staples each. Actually it was a little more than that . Ryobi claims the batteries are good for 1200 staples each. Actually it was a little more than that . Rated 5 out of 5 by Richard from Perform Great! So far so good!... Perform Great! So far so good!